The clearest evidence that B cells play an important role in human autoimmunity is that immunotherapies that deplete B cells are very effective treatments for many autoimmune diseases. All people, healthy or ill, have autoreactive B cells, but not at the same frequency. A number of genes influence the level of these autoreactive B cells and whether they are eliminated or not during development at a central checkpoint in the bone marrow (BM) or at a later checkpoint in peripheral lymphoid tissues. These genes include those encoding proteins that regulate signaling through the B-cell receptor complex such as Btk and PTPN22, proteins that regulate innate signaling via Toll-like receptors (TLRs) such as MyD88 and interleukin-1 receptor-associated kinase 4, as well as the gene encoding the activation-induced deaminase (AID) essential for B cells to undergo class switch recombination and somatic hypermutation. Recent studies have revealed that TLR signaling elements and AID function not only in peripheral B cells to help mediate effective antibody responses to foreign antigens, but also in the BM to help remove autoreactive B-lineage cells at a very early point in B-cell development. Newly arising B cells that leave the BM and enter the blood and splenic red pulp can express both AID and TLR signaling elements like TLR7, and thus are fully equipped to respond rapidly to antigens (including autoantigens), to isotype class switch, and to undergo somatic hypermutation. These red pulp B cells may thus be an important source of autoantibody-producing cells arising particularly in extrafollicular sites, and indeed may be as significant a source of autoantibody-producing cells as B cells arising from germinal centers. Patients with rheumatoid arthritis (RA), systemic lupus erythematosus (SLE) or other autoimmune diseases have been treated successfully with B-cell-depleting therapies [1–3], demonstrating the key role that cells in the B-cell lineage play in human autoimmune disorders. B-lineage cells may contribute to the development of autoimmunity either as antigen-presenting cells, cytokine-producing cells, or autoantibody (autoAb)-producing cells. The role of B cells in autoimmunity has been reviewed recently [4–6]. Pathogenic autoAbs generally have the following three properties: reactivity with autoantigens; the IgG isotype; and somatic mutations. Since most B cells giving rise to autoAbs have undergone isotype class switch recombination (CSR) and somatic hypermutation (SHM), which both require activation-induced deaminase (AID) , many studies have focused on defining where in development B cells display autoreactivity and where they express AID and undergo CSR and SHM. In this review we focus on recent studies underscoring the importance of B-cell subpopulations and innate signaling pathways in the steps leading to B-cell dysregulation and auto immunity. B cells arise in the bone marrow (BM), and after undergoing selection they enter the bloodstream and seed the periphery as immature B cells found in blood and in the red pulp (RP) of the spleen (Figure 1). Some of these immature B cells are selected further to become mature follicular B cells, which in turn become memory B cells after exposure to antigen. Checkpoints for elimination of autoreactive B cells. B-cell receptors in developing B cells are generated by random V(D)J gene recombinations, resulting in nearly 75% B cells with polyreactivity. A significant portion of polyreactive specificities are eliminated thought the mechanisms of receptor editing or deletion at the central tolerance checkpoint. Newly formed B cells, which have escaped negative selection in the bone marrow, migrate to the periphery and either enter the splenic red pulp or circulate thought the blood. An additional selection of autoreactive B cells occurs at the peripheral checkpoint in the spleen as newly emigrants become mature naïve follicular (FO) B cells. Upon exposure to antigen and additional selection steps, B cells can form germinal centers (GCs) and differentiate into memory B cells. Mutations in genes known to result in impaired negative selection at each checkpoint are indicated. Percentages refer to the frequencies of autoreactive B cells found in different cell subsets. Relative expression levels of activation-induced deaminase (AID) are also indicated. Btk, Bruton's tyrosine kinase; CD40L, CD40 ligand; CLPs, common lymphoid progenitors; IRAK4, interleukin-1 receptor-associated kinase 4; PTPN22, protein tyrosine phosphatase nonreceptor type 22. All humans have autoreactive B cells. The B-cell repertoire is created by random V(D)J gene recombination in B-cell precursors within the BM, which produces a population of newly formed B cells with a highly diverse set of B-cell receptors (BCRs) (Figure 1). Human immature B cells in blood can be defined as CD20+CD27 - CD38hiCD24hiCD10+ cells and further subdivided into CD21lo and CD21hi populations ; the CD21lo subset based on several criteria is less mature and in vitro produces higher levels of autoAb. The human spleen contains the highest levels of the CD21lo subset . Using a novel single-cell PCR method, Meffre and Wardemann found that 75% of recombinant antibodies cloned from single, very immature BM B cells were polyreactive; that is, they reacted with a number of self-antigens such as insulin, single-strand DNA and double-strand DNA, or were autoreactive as measured by binding to HEp-2 cells (a measure of anti-nuclear antibody) [5, 9]. The frequency of autoreactive cells remains high (25 to 45%) in slightly more mature BM B cells or in CD20+CD10+CD21loIgMhiCD27 - immature blood B cells . Transition from the immature B-cell phenotype to the so-called mature CD20+CD10 - CD21hiIgMhiCD27 - phenotype leads the frequency of autoreactive B cells to decrease once again to 10 to 20%. Based on these studies, the majority of autoreactive B cells in the periphery of humans appear to be in the CD21lo B-cell population . Based on these findings, Meffre, Wardemann and others have suggested that there are two major check points where autoreactive B cells normally are eliminated (Figure 1): a checkpoint in the BM that eliminates polyreactive and autoreactive immature BM B cells, most probably through deletion and receptor editing [4–6]; and a checkpoint in the periphery where autoreactive B cells are eliminated as immature B cells become mature B cells. Dysregulation of either one or both of these check points may occur in patients with autoimmune diseases including RA, SLE, Sjögren's syndrome and type 1 diabetes, who have elevated frequencies of autoreactive immature blood B cells [5, 11, 12]. A systematic analysis of patients with immunodeficiency diseases has uncovered which signaling elements are necessary for each checkpoint to operate . X-linked agammaglobulinemia patients with mutations in the Bruton's tyrosine kinase (Btk) gene and patients with mutations in the protein tyrosine phosphatase non-receptor type 22 (PTPN22) gene have an increased frequency of autoreactive immature B cells [5, 13]. Both Btk and PTPN22 participate in BCR signaling pathways, and the mutations leading to increased levels of auto reactive immature B cells lead to reduced BCR signaling. For instance, the PTPN22 polymorphism (C1858T) associated with increased autoreactive B cells leads to a substitution of tryptophan for arginine at residue 620 (R620W). This results in reduced binding of PTPN22 with the Csk kinase, yet paradoxically leads to lower B-cell responses . One possibility is therefore that defective BCR signaling in these patients leads to fewer B cells being deleted or edited at a central tolerance checkpoint in the BM (Figure 1). However, the C1858T PTPN22 mutation may also promote autoimmunity via other pathways that regulate memory B-cell formation  and dendritic cell (DC) responsiveness . Furthermore, although mutations in Btk and PTPN22 lead to intrinsic defects in B cells, they could also affect non-B cells because Btk or PTPN22 can function in signaling pathways not associated with the BCR [16, 17]. Therefore, while genetic data strongly support the link between polymorphisms in PTPN22 and susceptibility to a number of autoimmune diseases including SLE, RA, type 1 diabetes, and auto immune thyroiditis, further studies are needed to define where and how PTPN22 functions. Patients deficient in key Toll-like receptor (TLR) signaling pathway elements such as the MyD88 adaptor protein, the interleukin-1 receptor-associated kinase 4 (IRAK4), and the UNC93B1 transporter also have elevated frequencies of polyreactive immature B cells . These data suggest that TLR-mediated signals along with BCR signals regulate whether autoreactive B cells enter the immature B-cell pool. Defects in the selection of autoreactive B cells in MyD88-deficient and IRAK4-deficient patients were associated with impaired receptor editing. Whether these effects are linked to one specific TLR has not yet been determined. UNC93B1 can physically associate with human TLR8  and regulates TLR7/9 trafficking , and thus may affect responses to RNA and DNA. The fact that TLR signaling pathways function in early selection steps leading to removal of autoreactive B cells is a remarkable and surprising finding given that prior studies have emphasized the role of TLR signals in promoting the activation and expansion of autoreactive B cells in the periphery (see below). Somewhat paradoxically, despite the increased frequency of autoreactive B cells in the periphery, IRAK4-deficient, MyD88-deficient and UNC93B1-deficient patients do not develop autoAbs or autoimmune disease; this underscores the importance of TLRs in the activation of autoreactive B cells in the periphery and the generation of pathogenic autoAbs. MyD88, IRAK4 and UNC93B1 are also needed in humans for the second B-cell checkpoint to work in the periphery; that is, for autoreactive B cells to be reduced in what Meffre and colleagues define as CD19 + CD10 − IgM + CD27 − mature naïve B cells. Furthermore, a recent study suggests that Btk plays a key role in regulating a peripheral B-cell checkpoint in mice . Given that these signaling elements play an important role in central B-cell tolerance, however, it is not entirely clear to what extent the increased levels of autoreactive B cells after the peripheral checkpoint reflect a defect in peripheral selection per se in MyD88-deficient, IRAK4-deficient and UNC93B1-deficient patients or whether they are a consequence of defective central tolerance. An additional distinct set of signaling elements, including CD40 ligand (CD40L) and MHC class II, also appears to be required for the peripheral checkpoint. The reason for this is not entirely clear; one possibility is that CD40L and class II may be needed to activate regulatory T cells controlling peripheral B-cell tolerance , but this is just one speculation. Elevated levels of the B-cell pro-survival factor BLyS (B-cell activating factor (BAFF)) have also been suggested to play a role in promoting autoreactive B-cell survival at this checkpoint [6, 21, 22]. BAFF transgenic mice develop T-cell-independent lupus-like disease  in part by upregulating TLR7/9 expression in B cells. TLR7/9 ligands in turn may contribute to a break in peripheral B-cell tolerance by inducing BAFF expression in several cell types including synovial fibroblasts  as well as by increasing expression of the TACI and BAFFR receptors for BAFF [23, 25]. The classic T-cell-dependent humoral response leads to the formation of germinal center (GCs), where B cells expressing high-affinity receptors for antigens present on follicular dendritic cells (FDCs) as immune complexes are selected and become memory B cells or long-lived IgG-producing plasma cells (PCs) [26, 27]. During this efficient selection process, AID is expressed and both CSR and SHM are activated . While the end-goal of SHM is to generate B cells with increased affinity for foreign antigens, SHM also has the potential to contribute to the generation of autoreactive B cells. Does the process of GC formation contribute to the generation of B lineage cells producing high-affinity IgG autoAbs? For some conditions, the answer to this question clearly is 'Yes'. Mice in which the FcγRIIB receptor gene had been deleted (FcgRIIB KO) develop high-affinity IgG autoAbs and an SLE-like disease . These FcgRIIB KO mice have increased levels of autoreactive GC B cells including anti-nuclear antibody-expressing B cells that arose as a direct result of SHM. SHM has also been shown to play a major role in the generation of autoreactive antibody in a second lupus-prone mouse model , as well as in humans with SLE [30, 31]. In addition to the role of AID and SHM in generating autoreactive GC B cells, dysregulated negative selection of GC B cells is required for development of autoAb-producing PCs. B-cell selection in GCs is normally mediated by antigen acquisition from FDCs followed by antigen presentation to rare CD4 T-follicular helper cells. Presentation to CD4 T-follicular helper cells is thought to be the limiting step in the selection process, allowing GC B cells with high-affinity BCRs to outcompete lower-affinity B cells for antigen and subsequent CD4 T-follicular helper cell help. Lack of sufficient survival signals both from FDCs (for example, antigen, ICAM-1, CD40L) and from CD4 T-follicular helper cells (for example, ICOS, CD40L, IL-21) can result in apoptosis, thereby deleting cells that have too low affinity for antigen to be competitive, or for which there is no cognate CD4 T-cell help. How autoreactive GC B cells escape this 'deletion by neglect' is not entirely clear, but could involve multiple mechanisms - including, for example, abnormalities that lead to excessive accumulation of CD4 T-follicular helper cells in GCs  and B-cell intrinsic dysregulation of prosurvival factors in mice containing the Sle1 locus . Despite selection mechanisms that result in deletion of autoreactive GC B cells, such cells do find their way into the periphery. This is inferred from observations that some CD27+ IgG+ memory B cells in humans express BCRs that are polyreactive or self-reactive [31, 34]. Although long-lived PCs are also derived from GCs, it is interesting to note that the frequency of polyreactive and self-reactive PCs in the BM is much lower compared with the circulating memory B-cell pool in both healthy individuals and mice [31, 34], despite the fact that BM PCs harbor more somatic mutations [34, 35]. These observations imply that selection of GC B cells into the long-lived PC pool requires an additional checkpoint for autoreactivity that is not required for memory B-cell fate. Selection of GC B cells to become meory cells can occur quite rapidly in mice (within the first week of the immune response) , whereas BM PCs are not detected until the second and third weeks. This suggests that GC B cells destined to become long-lived PCs have endured a longer time in the GC compared with memory B-cell precursors. The antibodies produced by autoreactive or polyreactive PCs in the BM are often not pathogenic; however, they may be predictive of later disease onset in some individuals, indicating that additional factors beyond autoAb production are required for disease culmination . Additionally, depletion of B cells through anti-CD20 mAbs such as rituximab is not effective for eliminating circulating autoAbs for certain autoimmune disorders including RA and SLE (reviewed in ). This implies that long-lived PCs, which are resistant to depletion with anti-CD20 mAbs, are the source of these antibodies in these particular autoimmune disorders. Despite the importance of GCs as sites of SHM, a growing body of data has demonstrated that AID expression and the AID-associated activities CSR and SHM also occur in B-cell populations residing in the BM and RP of the spleen. Mao and colleagues showed nearly 10 years ago that immature B cells in the mouse express AID and have somatic mutations . The mutation frequency was not changed in the absence of T cells, a finding confirmed in later studies [40, 41]. Two subsequent studies showed that AID is in fact expressed at higher levels in immature B cells than in follicular B cells in the spleen [40, 41]. Ueda and colleagues found that splenic IgM+D - immature B cells increased twofold to eightfold in number after they immunized mice with antigen in incomplete Freund's adjuvant, while follicular and marginal zone (MZ) B cells did not increase . The immature B cells expressed both TLR4 and TLR9 and proliferated after stimulation with either lipopolysaccharide (TLR4L) or CpG (TLR9L). Remarkably, lipopolysaccharide or CpG also induced the immature B cells to become IgG-producing antibody-forming cells (AFCs) in a CD154-independent manner. Furthermore, when the immature B cells were adoptively transferred into mice, they were just as capable as follicular B cells of being induced by a bacterial vaccine to become AFCs. The immature B cells expressed Igα, Igγ2a, and Igγ2b germline transcripts [40, 41]. This study demonstrated that the B-cell population that contains high frequencies of poly-reactive BCRs (that is, immature B cells)  is also capable of responding to antigen and undergoing CSR and SHM. In other words, immature B cells have all the prerequisites and propensity to become IgG autoAb-producing cells. However, further studies are needed to assess whether immature B cells produce IgG autoAbs in vivo; and if so, whether the autoAb produced is pathogenic. Recent data suggest that human immature B cells have similar properties to their murine counterparts. Carsetti's group showed that a significant fraction (26%) of human immature (transitional) B cells expand and proliferate in response to bacterial CpG DNA (TLR9 ligand) . As a result of such activation the immature B cells acquired a phenotype similar to IgM+ memory B cells and carried somatic hypermutations. The authors propose that the ability of immature B cells to undergo SHM - and we would add CSR - may serve as a protective mechanism against bacterial infection early after birth, at a time when immature B cells are the major type of B cell in the periphery . Interestingly most of the somatic mutations were introduced in VH1 and VH4/6 genes, which encode anti-CpG DNA specificity, suggesting that the resulting BCR signaling can cooperate with the TLR9 signaling (see below). It is not known whether a non-bacterial (endogenous) DNA triggers a similar activation of immature B cells. However, analysis of immature B cells in patients with autoimmune diseases suggests that this cell subset could contribute to the production of pathogenic autoAb. For example, increased frequencies of immature blood B cells have been observed in patients with SLE and Sjögren's syndrome . In mice, the propensity for immature B cells to produce IgG2b and IgG2c is dramatically increased by overexpression of TLR7 (Giltiay NV, Chappell CP, Sun X, Kolhatkar N, Teal TH, Kim J, Agrawal N, Buecher MB, Hamerman JA, Clark EA and Elkon KB, manuscript submitted). A combination of increased levels of immature cells and TLR7 dysregulation could thus predispose immature B cells to produce autoAbs. Newly arising B cells have been called immature or transitional based on the fact that they can give rise to other B-cell subsets. However, the fact that AID is intrinsically expressed in immature B cells - even from mice missing T cells, CD154 or the TLR signaling component IRAK4 - indicates that the term immature for these B cells is misleading. They are not simply precursors for other B cells, but rather are an innate B-cell pool in their own right, readily capable of responding rapidly to both antigen and TLR signaling and undergoing CSR, particularly under inflammatory conditions . Kelsoe and coworkers propose that 'TI responses by AID+ im/T1 B cells might produce Ab specificities, including autoreactive paratopes, unavailable in the mature follicular (MF) compartment' . In other words, the immature circulating B cells and splenic RP B cells may be a major source of IgG autoAbs in autoimmune diseases. The newly formed IgMlo cells that have recently left the BM and entered the circulation or spleen are also often referred to as transitional B cells, implying that these B cells are on their way to becoming something and do not have a fully developed function until they are selected to enter the mature B-cell pool. In fact, transitional B cells are capable of responding to antigen, particularly in conjunction with a TLR agonist, and can mature into AFCs and undergo CSR. Other B-cell populations capable of responding to antigen are often named based on their location as newly formed BM B cells, blood B cells, follicular B cells, follicular mature B cells or MZ B cells. We therefore wish to propose that an alternative and more accurate term for transitional 1 or immature B cells would be RP B cells (Figure 1). Remarkably, the RP B-cell genotype and gene expression profile appears to be highly conserved in evolution. Similar to RP mouse B cells, the VLR B-cell subset in evolutionarily distant lampreys, which can respond to antigens and secrete VLR-containing antibodies, also express TLR7, CXCR4, BCAP, IL-17R, and Syk as well as the cytosine deaminase CDA2, a possible AID precursor . If in fact ontogeny recapitulates phylogeny, then the early developing blood and RP innate B cells in mammals may represent the conservation of VLR B cells found in lampreys. Recent studies strongly suggest that AID is not only important for key functions in peripheral B cells, but also plays a role in B-cell tolerance at the BM central checkpoint. First, new emigrant immature B cells as well as mature naive B cells from AID-deficient patients express an abnormal immunoglobulin repertoire and high frequencies of autoAbs, demonstrating that AID is required for normal establishment of central B-cell tolerance . AID is expressed in early B cells not only in the spleen but also in the fetal liver and BM, and AID expression in early human B cells, as with mouse B cells [39–41], is upregulated by TLR signaling. AID is also essential for normal B-cell tolerance in mice. Kuraoka and colleagues established chimeric mice containing both wildtype BM and BM from Aicda-deficient (the gene encoding AID) mice (Aicda KO) . Although the chimeric mice had similar levels of wildtype and Aicda KO myeloid cells and T cells, they had significantly more Aicda KO immature B cells and mature B cells than wildtype B cells. In other words, Aicda KO immature B cells have a selective advantage over wildtype immature B cells. Aicda mice also displayed a defect in removing autoreactive BM B cells. These data strongly suggest that the central tolerance BM checkpoint is defective without AID. Just how AID functions to regulate the central checkpoint in the BM is unclear. While CSR does occur in newly developing BM B cells, Mao and colleagues detected SHM in BM immature B cells . This observation suggests that AID might facilitate mutations away from autoreactivity. Alternatively, through its cytidine deaminase activity, AID might demethylate DNA and thereby in some way regulate steps during either V(D)J recombination or receptor editing. Kuraoka and colleagues found that AID-deficient immature BM B cells are more resistant to BCR-induced cell death than wild-type B cells, suggesting that AID may normally contribute to inducing DNA damage to ensure apoptosis at the central tolerance checkpoint . One would not be surprised if AID has functions distinct from mediating SHM and CSR, given that an AID counterpart is expressed in lamprey B-lineage cells prior to the onset of CSR in evolution . Although the process of SHM in GC B cells has the potential to generate autoreactive antibody mutants, GCs may not be the origin of all autoreactive B cells that arise via SHM. Using a mouse model that recapitulates the production of anti-IgG rheumatoid factor autoAb, William and colleagues showed that B-cell activation and differentiation, including CSR and SHM, took place solely within extrafollicular regions of the spleen, namely the RP and MZ-associated bridging channels, but not in GCs (Figure 2) . The SHM that takes place in a GC-independent fashion in this model of autoimmunity may be a unique feature of humoral responses against self-antigen. Follicular and extrafollicular origins of autoantibody-producing plasma cells. 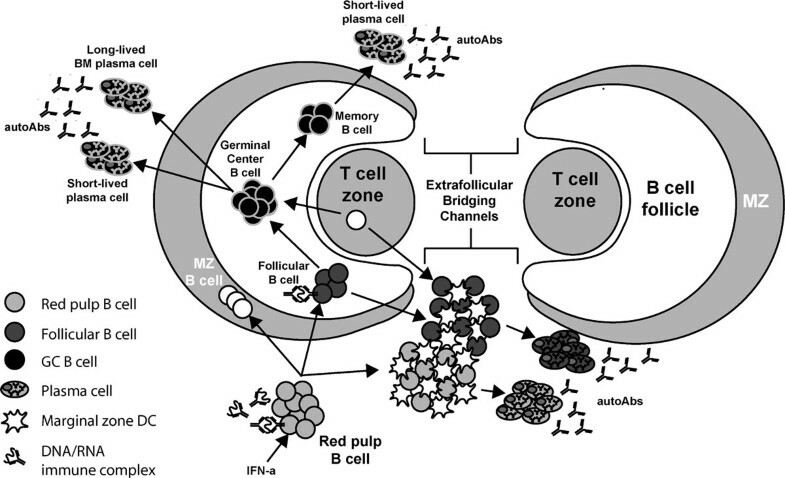 Autoreactive red pulp B cells and follicular (FO) B cells that encounter autoantigens in conjunction with Toll-like receptor and other innate signals differentiate to autoantibody (autoAb)-producing antibody-forming cells in extrafollicular bridging channels, where marginal zone (MZ) dendritic cells (DCs) may promote autoAb responses and plasma cell (PC) survival through direct antigen presentation and production of soluble mediators such as IL-6, BAFF, or APRIL. Extrafollicular autoAb responses involve activation-induced deaminase-dependent class-switch recombination and somatic hypermutation (SHM) that in some cases is also T-cell independent. FO B cells may additionally migrate to germinal centers (GCs) within follicles where autoreactive B cells arising through SHM may escape selection mechanisms via B-cell intrinsic or extrinsic factors to become additional sources of pathogenic autoAbs in genetically predisposed animals and humans. These cells include both short-lived and long-lived PC populations. APRIL, a proliferation-inducing ligand; BAFF, B-cell activating factor; BM, bone marrow. Interestingly, similar to AID expression in RP B cells , extrafollicular rheumatoid factor responses in the above mouse model did not require T cells, although AFC numbers and autoAb production were quantitatively enhanced in the presence of CD4 T-cell help . CD4 T cells have traditionally been thought necessary for CSR and SHM, yet recent studies have shown T-cell-independent CSR and SHM can be driven by CpG-engagement of TLR9, which is further enhanced by concomitant signaling through the BCR [42, 48]. BAFF and a proliferation-inducing ligand (APRIL) can also elicit T-cell-independent CSR . Recruitment of MyD88 to the trans-membrane activator TACI results in AID expression and CSR by activating NF-κB through a Toll-like signaling pathway, which is impaired in mice and humans lacking MyD88 or IRAK4 . Whether extrafollicular B-cell activation and differentiation (including SHM) that takes place in the RP of the spleen is a general feature of autoAb responses in humans is not yet clear. B cells are required for the organization of lymphoid structures in secondary lymphoid organs via surface lymphotoxin-α/β expression , and B-cell depletion in mice results in disruption of follicles . This ability to drive the organization of lymphoid follicles is important in the context of autoimmunity because tertiary, ectopic lymphoid structures have been described in nonlymphoid tissues in multiple autoimmune disorders in both humans and mice [53, 54]. Within these structures, FDCs apparently drive the activation of B cells and T cells, leading to local production of inflammatory cytokines and autoAbs. The processes of B-cell activation and differentiation do not necessarily need to occur within archetypal B-cell follicles of secondary lymphoid organs. Why might some autoreactive B-cell responses initiate and progress in extrafollicular spaces, as opposed to the classical follicular GC memory pathway? The GC is a specialized microenvironment whereby FDCs, CD4 T cells, and B cells interact in a coordinated fashion to exchange cognate antigen and co-stimulatory signals [26, 27, 55]. Although not as well defined as GC structures, extrafollicular bridging channels in the spleen are also regions that contain a high concentration of DCs (MZ DCs, not FDCs) that are in juxtaposition with T cells and the apical poles of B-cell follicles . Circulating lymphocytes, such as RP B cells, must pass through the bridging channel microenvironment when migrating into follicular regions of the spleen, thereby coming into close contact with MZ DCs (Figure 2). Similar to follicular GCs and ectopic GC-like structures, therefore, extrafollicular bridging channels are an optimal microenvironment whereby B cells, T cells, and DCs are in juxtaposition to one another. Both B cells and DCs have been implicated as being critical antigen-presenting cells in autoimmune disorders. The contribution of DCs to autoimmunity is not well studied, but they are assumed to be critical for initiation and progression of disease due to their established role in priming T cells during responses to foreign antigens. MZ DCs, but not CD8α+ DCs located in T-cell zones, express a wide variety of C-type lectin receptors  that are often involved in uptake and removal of apoptotic/dead cell debris , which has been implicated as a source of autoantigen . Furthermore, due to their unique position in bridging channels, MZ DCs are optimally positioned to interact with multiple B-cell populations including circulating mature and immature B cells, MZ B cells, as well as RP B cells that have yet to undergo peripheral selection (Figure 2). These potential interactions are significant because DCs can have multiple direct effects on B cells that include T cell-independent CSR as well as supporting the survival of short-lived PCs through production of soluble mediators including IL-6, BAFF, and/or APRIL [49, 59, 60]. Additionally, DCs can directly present antigen to B cells via a nondegradative recycling pathway following antigen internalization [61, 62]. The precise contributions that DC/B-cell interactions make toward initiating or sustaining extrafollicular autoAb responses is unknown, but constitutive depletion of DCs in SLE-prone MRL.Fas lpr mice demonstrated a striking reduction in plasmablast and autoAb production . This reduction was not due to a lack of CD4 T-cell activation because CD4 T cells were highly activated in the absence of DCs. The DCs were therefore critical for the development of autoAb-producing AFCs but not for the initiation of CD4 T-cell responses. Consistent with these findings, our laboratory has recently shown that delivery of antigen directly to MZ DCs in mice using a mAb resulted in extrafollicular B-cell activation via direct interaction with B cells, which led to the development of extrafollicular antibody responses . One should note that autoAb production in the MRL.Fas lpr mouse model is mainly derived from extrafollicular responses, which is not the case for all mouse lupus strains. Furthermore, the roles that DC subsets play in human lupus are not clear. The importance of DCs in generating lupus-like disease and extrafollicular antibody responses therefore requires further study. Nevertheless, these findings suggest that depletion of one or more DC subsets may be an avenue of investigation for future immunotherapies aimed at ameliorating autoAb production derived from short-lived PCs. In this section we focus on the important role of innate signaling pathways involved in the activation of potentially autoreactive B cells, including both B-cell intrinsic and B-cell extrinsic signals (Figure 3). Innate signaling pathways involved in the activation of autoreactive B cells. Autoreactive B cells bind DNA/RNA-containing complexes from dying cells or immune complexes (ICs), consisting of IgG bound to nuclear antigens and become activated though dual engagement of their surface B-cell receptor (BCR) and nucleic-acid sensing Toll-like receptors TLR7 and TLR9. Upon binding, the BCR internalizes and delivers DNA/RNA-containing antigens to the endosomal/lysosomal compartment. TLR7 and TLR9 traffic from the endoplasmic reticulum to endosomal/lysosomal compartments using UNC93B1 transporter. BCR and TLR signals collaborate in promoting B-cell survival, activation and proliferation. 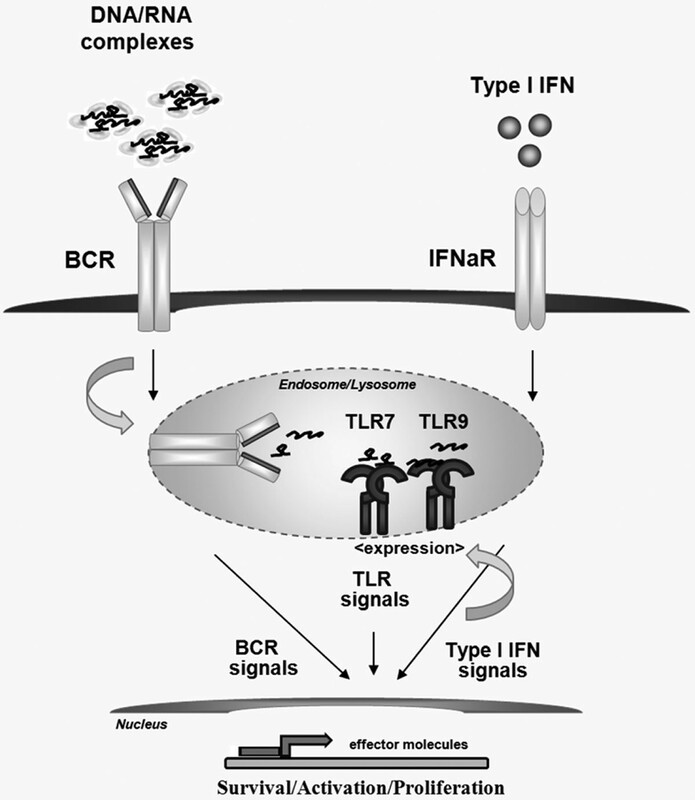 Type I interferon (IFN) (produced mostly by activated plasmacytoid dendritic cells (pDCs)) primes autoreactive B cells by promoting the expression of TLRs and synergizing with the BCR signals. As described above, despite the extensive negative selection of B cells both in the BM at a central checkpoint and at a peripheral checkpoint, a substantial portion of autoreactive specificities remain present in the peripheral B-cell pool. Most of these autoreactive B cells are HEp-2 reactive, suggesting that they carry specificities for DNA-containing and/or RNA-containing ligands . This is noteworthy since anti-nuclear autoAbs play a key role in the pathogenesis of SLE as they form immune complexes that deposit in the kidneys, blood vessels and skin. In addition, autoAbs can engage complement and FcγR on other cells, promoting local tissue inflammation. What then are the underlying mechanisms leading to the activation of autoreactive B cells? Studies in murine autoimmune models have established that naive autoreactive B cells with low affinities for DNA-associated or RNA-associated antigens or rheumatoid factor, which have escaped the central and peripheral checkpoints, can be activated through dual engagement of their surface BCRs and intracellular DNA/RNA sensing receptors, such as TLR7 (single-strand RNA) and TLR9 (CpG-DNA) [65–68]. The probable source of this endogenous RNA/DNA-containing material is cellular debris from dying/apoptotic cells or immune complexes, consisting of IgG, bound to mammalian chromatin or RNA-containing antigens. Increased cell death and insufficient clearance of dying cells have been implicated in the development of SLE . Macrophages from SLE patients have an impaired ability to phagocytose apoptotic bodies [69, 70]. Although mammalian DNA is considered a poor ligand for TLR9, modified (unmethylated) CpG-rich DNA may have high immunostimulatory potential . Interestingly, some SLE patients have defects in DNA methylation , implying that they have higher levels of TLR9-activating ligands. Regarding specificity, TLR7 seems to be even less selective than TLR9 as it can recognize GU-rich sequences of single-strand RNA from both viral and mammalian origin . The mechanism by which B cells come in contact with and take up antigens in vivo is still unclear and probably depends on their location . While it is possible for B cells to directly bind to nuclear-containing antigens exposed on the surface of cellular debris/apoptotic material, it is also likely that they bind antigens presented on the surface of DCs and macrophages [62, 64]. Neutrophil extracellular traps might represent an additional source of nucleic-acid-containing cellular debris in SLE . Recent studies have demonstrated that neutrophils can colonize peri-MZ areas of human spleens and induce CSR, SHM and antibody production through T-cell-independent mechanisms involving BAFF, APRIL and IL-21 . Furthermore, impaired neutrophil extracellular trap degradation has been associated with renal pathology in some SLE patients . The splenic RP and MZ-associated bridging channels might represent key sites for the activation of polyreactive B cells. Recent studies from our laboratory suggest that dysregulation of TLR7 expression in TLR7 transgenic mice drives the expansion and proliferation of newly emigrant RP B cells . This abnormal activation is driven intrinsically by TLR7 in B cells, and is associated with upregulation of AID and increased production of antibodies - suggesting that when TLR7 signaling is dysregulated in RP B cells, they may produce IgG, including IgG autoAbs. The exact molecular mechanisms mediated via the synergistic BCR/TLR engagement remain poorly understood. One current model suggests that, following binding to nucleic-acid-containing antigens, BCRs are internalized inside cells and antigen complexes are delivered to TLRs localized in the endosomal/lysosomal compartments (Figure 3). In a resting state, TLR9 is concentrated in the endoplasmic reticulum and redistributes from the endoplasmic reticulum to endosomes upon stimulation with CpG DNA . Furthermore, BCR crosslinking followed by BCR internalization initiates a signal that recruits TLR9-containing endosomes into autophagosome compartments by utilizing microtubular networks and phospholipase D . Several molecules have been implicated in the regulation of the TLR intracellular trafficking, including gp96, PRAT4A, and UNC93B1 . UNC93B1, which can associate with TLR3, TLR7 and TLR9, may orchestrate TLR trafficking and plays a key role in regulating autoimmunity. Fukui and colleagues identified a mutation in mouse UNC93B1 that can shift its binding away from TLR9 to binding TLR7, which in turn leads to lethal inflammation and development of an SLE-like disease . The relative contribution of individual TLRs in the development of SLE disease in mice has been a major focus of studies in the past few years. Marshak-Rothstein, Shlomchik and coworkers first reported the ability of chromatin/DNA-associated antigens to activate autoreactive B cells by the combination of BCR/TLR9 signals [67, 68]. In a similar manner, dual engagement of BCR/TLR7 with RNA-associated antigens can mediate B-cell activation . These studies predicted that deletion of either TLR7 or TLR9 would reduce the development of SLE disease in mice. However, follow-up studies suggested that TLR7 and TLR9 might have opposing functions in the regulation of SLE . MLR/lpr lupus-prone mice deficient for TLR7 have a significant reduction in titers of autoAbs specific for RNA-associated autoantigens and develop less severe kidney pathology . Increasing the Tlr7 gene dosage, on the contrary, promotes the development of murine SLE. The BXSB/MpJ mice - which carry the Y-linked autoimmune acceleration translocation of the locus encoding Tlr7 (along with other genes) from the × chromosome onto the Y chromosome and have one extra copy of TLR7 - develop an SLE-like phenotype associated with production of anti-nuclear autoAbs and increased type I interferon. While Y-linked autoimmune acceleration mutation alone is insufficient to induce significant autoimmune disease, it greatly accelerates the development of SLE in lupus-prone FcγRIIB -/- mice . Furthermore, increasing the Tlr7 gene dosage in TLR7 transgenic mice leads to an acute systemic autoimmune disease, characterized by myeloproliferative syndrome, glomerulonephritis and the production of anti-RNA autoAbs . In contrast, the depletion of TLR9 in lupus-prone mice surprisingly accelerates disease development, suggesting a possible regulatory role for TLR9 in autoimmunity and SLE [84, 85]. One explanation of this phenomenon is that TLR9 might function to regulate TLR7 responses. A possible contribution of TLR9 to early B-cell development and induction of central tolerance is also worth considering. TLR8, another single-strand RNA binding receptor, may also regulate TLR responses. TLR8-deficient mice develop spontaneous SLE-like disease, which can be reversed by deletion of TLR7 . Gene-expression profiling of human B cells revealed that both new emigrant and mature naïve B cells express detectable levels of TLR7 and TLR9, but not TLR8. Whether the divergent activities of TLR7 and TLR9 exist in human B cells needs to be investigated. Testing whether abnormalities in UNC93B1 are a risk factor for the development of human SLE will also be of interest. Genetic studies so far support a role for TLR7 and TLR9 in the development of SLE in humans [87–89]. External factors that can influence the induction of TLRs might promote the sensitivity of peripheral B cells to DNA-containing and RNA-containing antigens and promote the development of SLE. Such stimuli could involve viral infections, UV damage, and so forth. The importance of intrinsic activation of B cells through dual engagement of BCR/TLRs in human SLE needs further investigation. It should be noted that the effects of TLRs on B-cell functions are not limited to production of autoAbs, but can also stimulate the secretion of proinflammatory cytokines, which can affect the activation of T cells and amplify the inflammatory responses. Increased production of type I interferons (such as IFNα and IFNβ) and upregulation of type I interferon-regulated genes (interferon signature) are key features of active SLE disease [90–92] (reviewed in [93–95]). Increased interferon signatures also correlate with the appearance of high-affinity antibodies against nucleic-acid-containing antigens [93, 94]. Studies in mice have demonstrated synergistic effects of BCR and interferon signals in activating low-affinity B cells and generation of class-switched antibodies . Recent studies have suggested a model in which type I interferons play a key role in "priming" the B cells by promoting the expression of TLRs. This role seems to be especially important when it comes to TLR7 responses, as murine B cells missing type I interferon receptor respond weakly to TLR7 ligands [97, 98]. Similarly, human naive B cells require IFNα produced by plasmacytoid dendritic cells (pDCs) to expand and differentiate into immunoglobulin-producing PCs in response to TLR7 ligation in vitro . Both pDCs and macrophage populations are known, major producers of type I interferons. Uptake of DNA/RNA-associated self-antigen immune complexes can lead to activation of pDCs through TLR9 and TLR7 and induce the production of type I interferons . pDCs therefore play a key role in promoting pathogenic B-cell responses. Increased production of BAFF/BLyS and APRIL by DCs and monocytes is also a possible consequence of increased production of type I interferon by activated pDCs. Tremendous strides have been made in B-cell depletion-based therapies to treat a range of autoimmune diseases [38, 100]. Current and developing therapies include receptor-based therapies to deplete B cells (for example, CD20, CD22), blockade of survival factors (anti-BAFF) and inhibitors to block B-cell signaling and homeostasis (Syk inhibitors). Current and upcoming therapies for SLE have been reviewed recently (for example, [3, 101]). Here we highlight therapies that target B-cell signaling pathways. Current B-cell depletion therapies have derived from a deeper understanding of B-cell biology and markers that define B-cell populations. The fact that autoreactive and autoAb-producing B-lineage cells are sustained and regulated by BCR and TLR signals and by survival factors such as BAFF/BLyS has led to a number of drugs targeting B-cell-associated signaling pathways. B-cell survival requires tonic signals through the BCR that are mediated in part by the Syk, Lyn and Btk protein tyrosine kinases and by phosphoinositide 3-kinase. Inhibitors for each of these kinases have been developed and used to successfully treat B-cell cancers such as chronic lymphocytic leukemia , and are just beginning to be fully evaluated in patients with autoimmune diseases. Syk inhibitors affect a number of cell types including B cells and platelets. Phase II clinical trials suggest that an oral Syk inhibitor, R788 (fostamatinib), may be efficacious for the treatment of RA . R788 also delayed disease progression and prolonged survival in NZB/W F1 mice  and reduced established skin disease in lupus-prone mice . Just how R788 works in vivo is not entirely clear, but in one study where R788 delayed spontaneous diabetes in NOD mice, it also reduced total B-cell numbers and serum immunoglobulin levels while at the same time increasing the numbers of IL-10-producing B cells . Fostamatinib may be more effective at depleting human transitional B cells than mature B cells , and thus potentially could be useful for treating autoimmune diseases where RP B cells are a source of autoAb-producing cells. The fact that mice overexpressing Btk develop a lupuslike disease  suggests that Btk inhibitors may be beneficial for treating SLE. The Btk inhibitor PCI-32765 (ibrutinib) selectively blocks BCR-induced activation of human B cells, and in mice inhibits the development of autoAbs, collagen-induced arthritis and lupus-like disease . In a collagen-induced arthritis model, PCI-32765 inhibited a number of different cell types including B cells, monocytes and macrophages . Whether these encouraging results in mice will be translatable for treatment of human RA and SLE remains to be seen. Many Btk-deficient patients have normal levels of CD21lo blood B cells [8, 11], implying that Btk inhibitors may not affect RP B-cell-driven autoAb production; further studies are needed to assess this possibility. Phosphoinositide 3-kinase is activated after BCR ligation and in turn leads to the activation of kinases such as Akt, required for B-cell survival. GS-1101 (CAL-101) reversibly inhibits the phosphoinositide 3-kinase catalytic subunit p110d, which is selectively expressed in B cells. The p110d subunit is an attractive target since p110d-deficient mice have a defect relatively restricted to B cells. Initial clinical trials treating chronic lymphocytic leukemia patients with GS-1101 are very encouraging . Mice with inactive p110d have lower levels of natural autoAbs, and a p110d inhibitor reduces autoAb responses in collagen II-treated rats . Bartok and colleagues reported recently that p110d is expressed in RA synovium, is induced by TNFα, and is a regulator of fibroblast growth and survival . Together these studies suggest that p110d inhibitors have the potential to be effective therapies for autoimmune diseases. However, p110d inhibition can also lead to increased production of cytokines such as IL-12  and can affect other cells such as eosinophils, and thus has the potential in some contexts to promote inflammation. TLR inhibitors are being actively developed and tested for treating autoimmune diseases . Here we wish to note that TLR7/9 inhibitors have the potential to act synergistically with BCR pathway inhibitors to reduce immune complex-driven autoAb production (Figure 3). Also noteworthy is the fact that anti-malarial agents such as hydroxychloquine, which both impair phagolysosomal functions and are TLR antagonists , are effective therapeutics for rheumatic diseases such as SLE and RA . Whether and how hydroxychloquine affects B-cell functions in patients with autoimmune diseases is not clear, although this anti-malarial can inhibit BCR-induced calcium mobilization  and can induce apop tosis in malignant B cells. Treatment of SLE patients with hydroxychloquine may impair the ability of pDCs in these patients to produce cytokines in response to TLR7 or TLR9 agonists . Hydroxychloquine may also down regulate TLR7 and TLR9 expression in lupus patients, and thus may affect protective immune responses to human papillomavirus . Whether or not these effects can be reduced by a combination of B-cell depletion and TLR inhibition is not known. We previously proposed that treatment of autoimmune diseases might be improved by combining B-cell depletion therapies with therapies that block or deplete innate immune cells . Certain DC subsets appear to be essential for initiating B-cell maturation into antibody-producing cells. When antigen is targeted to murine DCIR2+ DCs in the MZ and bridging channels of the spleen, B cells migrate to these DCs, where they are activated and programmed to interact with T cells and become IgG-producing PCs . While further studies are required to define which DC subsets promote and sustain autoAb formation, combined B-cell and DC depletion therapy remains an attractive future therapeutic approach. For example, since pDCs selectively express BDCA2, it may be worth assessing the therapeutic benefit of depleting both pDCs (anti-BDCA2) and B cells (anti-CD20). This could lead to depletion of both pathogenic B cells and IFNα that drives them. Now that B-cell depletion strategies are established, it should be possible to develop the means to deplete disease-associated DC populations as well. Natalia V Giltiay, Craig P Chappell contributed equally to this work. Unpublished observations cited in this manuscript were supported by funding from the National Institutes of Health (R01AI52203, and R37AI44257).